“I'm quite impressed with the elegance of your work and wonder if the issuers of these preferred stocks even realize what a nice market they have created!” - Mike T.
As part of our continuous improvement commitment, the CDx3 Newsletter has a new format this month. Not only is this new format easier and faster to read but it allows us to more easily accommodate a new service that we will be introducing later this summer. I hope that you find the new single-column articles appealing. Treasury announced its long-awaited Public-Private Investment Program (PPIP) during March and The Market responded by posting its largest monthly rally since 1987. In the Last Month's CDx3 Investor Results article I explain that the effects of the PPIP should show up first in near-term preferred stock market prices, especially those issued by The Protected Fifteen banks (see February price performance) that I identified for you last December (due to January acquisitions the list is now at fifteen rather than sixteen as reported last December | see December list). Then, as the PPIP program is rolled out this summer, we should see new preferred stocks offered at a lower dividend rate than the current average but the first issues are not likely to come from banks. Also during March, Citigroup announced an interesting program for its preferred stock investors, one where preferred shareholders can voluntarily convert their Citi preferred shares to Citi common stock at a very generous ratio. But is it worth missing out on the ongoing dividend income? This article also itemizes the 30 CDx3 Preferred Stocks that, during March, were identified to CDx3 Notification Service subscribers. These are 30 of the highest quality preferreds stock available and are currently paying an average annual dividend yield of 13.7% to CDx3 Investors. The Special Announcement article announces the availability of the April 2009 update to Preferred Stock Investing. Chapter 9 of the book lists all of the CDx3 Preferred Stocks issued since January 2001. Readers of the book are entitled to free periodic updates to these tables (by following the instructions within the book). The most recent update to Preferred Stock Investing became available on March 15, 2009. Preferred Stock Investing is available in a both e-book and paperback formats (see retailers). In the CDx3 Company Spotlight article I introduce you to DTE Energy, a $4.5 billion utility with business units reaching as far back as 1849 and issuer of CDx3 Preferred Stock. DTE is very involved with the Department of Energy, GM and Ford to develop plug-in hybrid vehicle technology. Anthony Earley, Chairman and Chief Executive of DTE, just joined Ford's board of directors. The CDx3 Question of the Month continues with what is probably our most popular topic - the market price behavior of a CDx3 Preferred Stock that is near its "call date" (when the issuing company regains the right to purchase your shares back from you at $25 per share). This month's question explores why the issuing company of a preferred stock that has reached its call date wouldn't just buy the shares back on the open market at today's bargain basement prices (which are around $20 per share) rather than officially "call" the issue (in which case they would owe holders $25 per share). With the unveiling of Treasury's PPIP program to deal with toxic bank assets, the next two recovery milestones for banks are (1) the stress test results and The Market's reaction to them during April and into May and (2) once the PPIP is implemented throughout this summer, whether or not banks will agree to sell their toxic assets at the auction-derived prices. Doing so will require the banks to realize the losses that these assets represent. To avoid the nasty hits, the banks may opt-out and just hope that this mess sorts itself out over the longer-haul. Subscribers to the CDx3 Notification Service have received the news, tips and tools that have been needed to navigate this Global Credit Crisis. Subscribers knew which banks to avoid and have been rewarded with 100% of their preferred stock dividends paying on time and in full. Please consider subscribing to the CDx3 Notification Service. April 2009 is going to be a very important month for preferred stock investors and I will report back to you in next month's CDx3 Newsletter. CDx3 Preferred Stocks are regular preferred stocks that are able to meet the ten selection criteria described in chapter 1 of my book, Preferred Stock Investing. Next Up: Buyers Say They'll Buy, But Will Sellers Sell? In last month’s issue of the CDx3 Newsletter (see article) I gave you an early heads-up about the then-unannounced Treasury plan for dealing with the toxic assets that are plugging up our credit system. Under the heading Toxic Asset Plan Should Lift Preferred Stocks I said “…the market should react very positively (even explosively so?) when Geithner announces a workable plan…” I went on to describe that the upcoming announcement was going to create funds (like mutual funds) that were composed of toxic bank assets; some performing, some not. The idea being that it would only take a couple of performers to offset the losses for all of the laggards. On March 23 Treasury secretary Tim Geithner announced the Public-Private Investment Program (PPIP – see summary) for dealing with toxic bank assets and The Market reacted immediately by having its biggest monthly gain since 1987. (3) Source of new issues: While the PPIP is a relief program for banks, new preferred stocks that we see later this year are not likely to come from banks. There is one specific industry that I am looking to that should lead the way with new preferred stock issues after the PPIP is implemented this summer. The extent to which they do so is a bellwether of the success of Geithner's plan. The next milestone will be the PPIP's actual implementation where we will find out the answer to the next question: will the banks sell their assets, as toxic as they may be, at the auction-determined price or just hang onto them and hope that things improve on their own over time? The April 2, 2009 "mark-to-market" accounting rule change by the Financial Accounting Standards Board (FASB) throws an interesting twist into answering that question. Banks are restricted to lending up to a certain percentage of their "Tier 1 capital." The toxic assets lower the Tier 1 values, so banks have been prevented from lending as much. The FASB rule change (taking the rule back to what it had been for the last 75 years until a few months ago) allows banks to revalue many of these assets at a higher value, freeing them up to lend. Energizing lending is the primary goal of the PPIP; so has FASB solved the problem or simply added a complimentary component that should help out? Will banks still opt to sell these assets this summer since they are suddenly not nearly as toxic as they use to be? Does it really matter, so long as credit starts flowing again to individuals and businesses? These are some of the points of impact on the marketplace for CDx3 Preferred Stocks that I will be watching in the coming months. If you hold Citigroup preferred stocks there are two different programs happening and it is important not to get them confused. On February 27 Citigroup announced that it was exercising its right to convert three of its fourteen preferred stock issues to common stock (see table). These three issues (C-I, C-P and C-M) were "convertible" preferred stocks which means that the issuer (Citi) has the right to convert them to common stock shares in accordance with the terms of the prospectuses for these issues. Citi did so on February 27, 2009. Note that only four of Citi's preferred stocks qualify as CDx3 Preferred Stocks and none of these four were included in Citi's February conversion (see related article). The CDx3 Selection Criteria (Preferred Stock Investing, chapter 1) protected CDx3 Investors from this conversion. In early March, Citi filed with the SEC for a new, separate preferred stock conversion program. This additional program has nothing to do with their February 27 preferred stock conversion. Rather, the new program relates to the remaining eleven trust preferred stocks (TruPS and ETruPS) from Citi. Under the March 2009 filing, Citi is going to invite holders of the remaining eleven Citi preferred stocks to voluntarily convert their preferred stock shares to common stock shares. Those who decline Citi's kind offer will continue to receive their dividend payments just as they would have otherwise. To compensate those who choose to volunteer for giving up the ongoing dividends that they would otherwise be earning, Citi is going to offer a very handsome conversion ratio, leaving volunteers with common stock that is worth several times the current market value of their preferred shares. The timing of the voluntary conversion offer is unclear but if you hold Citi preferred stocks you should receive a communication from Citi (via your broker) explaining the new voluntary program. 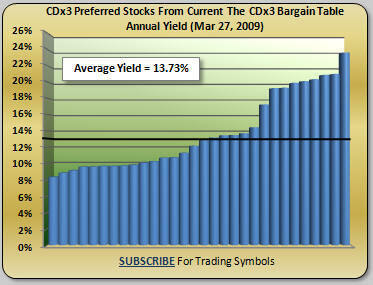 March 2009 was another perfect month for CDx3 Preferred Stocks - the highest quality preferred stocks available. CDx3 Preferred Stocks have never missed a dividend payment, not even during this two year old Global Credit Crisis. CDx3 Investors continue to be paid their dividends in full and on time. There are about 1,000 preferred stocks trading at the moment. If you were looking for the highest quality issues that were ripe for picking, how would you tell which ones to pick? Too many such decisions are based on emotions (fear or elation) rather than consistently applied and thoroughly researched criteria. The CDx3 Bargain Table (what’s this?) that subscribers to the CDx3 Notification Service received on March 28 identified 30 CDx3 Preferred Stocks for those considering a purchase. These are 30 of the highest quality preferred stocks available and they are issued by a variety of companies from a variety of industries. On March 27 I gathered the market prices of these 30 CDx3 Preferred Stocks. If you were to have purchased them at the March 27 price your average dividend yield would be 13.7% (see chart). The CDx3 Bargain Table is specifically designed to identify preferred stocks that are at a point in time that favors buyers (i.e. when they tend to be available for bargain basement prices) per the Rule of Buyer/Seller Behavior (Preferred Stock Investing, page 67). So not only were these high quality preferred stocks identified out of the pile of 1,000 trading today, they were identified at a point in time when, research shows, subscribers can find some real bargains. And subscribers to the CDx3 Notification Service receive an update to the CDx3 Bargain Table every month. The April 2009 update to the CDx3 Preferred Stock tables found in chapter 9 of Preferred Stock Investing is now available. Readers of Preferred Stock Investing are entitled to free periodic updates to the chapter 9 tables. On March 15, 2009 readers who had registered for the update received an email message making them aware of its availability and providing a download link. See page 124 of Preferred Stock Investing to receive your April 2009 update to the CDx3 Preferred Stock tables in chapter 9. DTE Energy is a diversified utility company involved in the development and management of energy-related businesses and services nationwide. DTE operates as several business units, the oldest two of which are Detroit Edison (serving 2.2 million customers) and MichCon (serving 1.2 million), founded in 1908 and 1849, respectively. DTE employs a workforce of over 9,800 people, has a market capitalization of $4.5 billion and is headquartered in Detroit, Michigan. On revenues of $9.3 billion, DTE closed out 2008 with $546 million in net income. During 2008 DTE announced that it had joined the Department of Engergy's Freedom CAR Research Partnership. The partnership is developing the fuel and infrastructure needed for commercialization of a full range of affordable and energy-friendly vehicles. DTE is also working with General Motors and Ford on their plug-in electric vehicle hybrid programs. In a related development, on March 31, 2009 Ford announced that DTE's Chairman and Chief Executive, Anthony Earley is joining Ford's board of directors. The call date on one of my five year old preferred stocks just arrived. Can the issuing company purchase their own preferred stock at today's low market prices or are they obligated to buy them back from me at $25 per share? Jim M.
Every CDx3 Preferred Stock has a five year life span between its introduction (the "IPO date") and its "call date" when the issuing company regains the right to buy your shares back from you. If they do so ("call" your shares), they must pay you $25 per share. What Jim is wondering is whether the issuing company can sneak around having to pay you $25 per share by going out to the open market, where the market prices are currently lower than $25 per share, and buy up the shares there on the cheap (and cheating you out of the higher $25 price). When purchasing preferred stock shares on the open market there has to be an agreeable buyer and an agreeable seller – it takes both. If a seller prefers to hold onto their shares until a future call they cannot be forced to sell their shares to the issuing company (or to anyone else). The only way the issuing company can compel a shareholder to sell their shares back to the issuing company is via a call (in the case of CDx3 Preferred Stocks). “Convertible preferred stocks” however work differently. In the case of convertible preferred stocks the issuing company can compel shareholders to convert their shares to common stock under the terms of the prospectus. This is what we saw Citigroup do with three of their preferred stocks in late February (see related article above). This is why the CDx3 Selection Criteria exclude convertible preferred stocks. Thanks to Jim M. for the great question. You will receive a free copy of the CDx3 Special Report "Dividend Accounting." The 20-month long credit crisis has shaken our financial system and everyone who is invested in it (which is just about everyone). Even though the CDx3 Selection Criteria, day after day, have successfully filtered out every failed bank for almost two years now, and even though there has not been so much as a missed dividend for those who have invested in CDx3 Preferred Stocks, there's still some anxiety. Whether market prices are driven down by uncertainty related to war (2002) or by a Global Credit Crisis (2007-09...), the market prices of CDx3 Preferred Stocks behave in certain ways at certain times. Part of Treasury secretary Geithner's Financial Stability Plan (see summary) announced in February included a stress test for our largest 19 banks ("systemic institutions"). Fed chairman Ben Bernanke clarified during congressional testimony that the stress test was "...not a pass/fail type of test..." as had been widely reported. Rather, the FSP's stress test is a data collection tool that is being used to measure the additional capital needs of these large banks in the event that the economy does not improve for another two years. Under the FSP, Treasury would purchase convertible preferred stocks from these banks over time in the amounts indicated by the stress test results. These banks have been working on the stress test since early March with the results due to Treasury during April. There will be enormous temptation on the part of the news media and bank competitors to cast the results of the stress test, once again, as "passing" or "failing." The extent to which The Market interprets a big capital requirement as having "failed" is going to have a lot to do with how the market prices of preferred stocks, especially those issued by big banks, do during April 2009. All based on a misunderstanding of the stress tests. Subscribers to the CDx3 Notification Service receive a calendar at the beginning of each month that shows them the exact dates that the Rule of Buyer/Seller Behavior (Preferred Stock Investing, page 67) says the market price of each CDx3 Preferred Stock shown on the calendar is likely to be at its lowest for the quarter - a good day for buyers. The April 2009 calendar was emailed to subscribers on March 27, 2009. If the media casts the stress test results as having "passed" or "failed" as they have so frequently done, the resulting turmoil could deliver a strong (albeit temporary) buying opportunity for CDx3 Investors and subscribers will know the exact day to take advantage of it. Chapter 9 of Preferred Stock Investing includes a list of all of the CDx3 Preferred Stocks issued since January 2001 and the investment results you would have achieved had you invested in them using the CDx3 Income Engine. And readers also receive free periodic updates to the preferred stock lists in chapter 9.